I spent the morning setting the floor for league play and class this evening. As I did this work I gave a great deal of thought to the difficulty of “league play” in a training center or agility club. Most agility students have little concept of the amount of work that goes into providing for a couple hours of class. Quite a bit of work goes into designing curriculum and managing schedule and registration for classes. But that’s onlyt he beginning of the work. Think about it… mowing and cleaning up outside; vacuuming the floor; putting away the old course; and setting up the new. I describe this work to point out that if we’re going to have a competition on top of the routine of class, we’ve added several important tasks. Seriously, the competition requires a judge, a time-keeper, a scribe; and a score-keeper, though the scorekeeping task can be done later. This is a real test of the culture and work ethic of the group. A lot of people come to class so that they can chat and be relaxed, expecting to do nothing more than manage their own dog and go out from time to time to take a turn on the floor. So the agility trainer/provider is likely to take a big pass on doing league play if it’s a boatload of new and unappreciated work. It’s a lovely idea to involve league players in the work of running a ring. Everybody should have a job. Everyone should know what work needs to be done around the ring, and how to do it. Introducing your group to league play should be as much about the work as about playing games. Our game this week is Dare to Double. I realized this week as I was setting the floor that the briefing, as written, is inadequate. 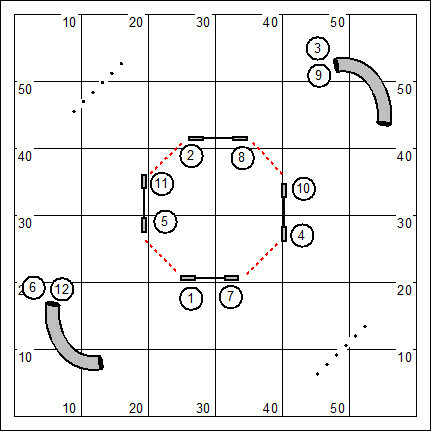 For example, the published briefing says, when defining point values for obstacles “7 points for one of the obstacles in the 5-point list, usually given to an obstacle in a difficult placement”. Eeek! This was clearly written for the course designer as the audience. In fact, when the briefing goes to the exhibitor, these things should be thoroughly defined. The weave poles will be the 7 point obstacle. There is no dogwalk and there is no teeter on the field. Consequently, there are no 5 point obstacles. Dare to Double is the invention of Darlene Woz and was the winner of the 1995 Clean Run magazine games contest. Dare to Double is a game of strategy and daring. This game is sometimes referred to as Double Dog Dare Ya. Dare to Double is a simple dog’s-choice game, which means that he will earn points for taking obstacles in the order and direction of his own choosing. The team has 50 seconds to accumulate as many points as possible. The game begins at the start line and ends at the table. The team must get to the table before course time elapses. If the team gets to the table before time expires, they keep all points accumulated on course. If the team fails to do so, half of the team’s points are lost. For our game… the weave poles will be the 7 point obstacle. The A-frame has a special value (Note that the A-frame was not included in this list above). It is the doubling obstacle. During the run, a handler may double his current points by performing the doubling obstacle. A successful performance doubles all points earned up to that time. If, however, the dog faults the A-frame, then the dog loses half of his existing points.A warning whistle is blown 15 seconds prior to the expiration of time. A handler may double points any time he wishes, as many times as he wishes. The only restriction on doubling is that the A-frame cannot be performed back-to-back. Thus, the handler must do another obstacle, for points, before attempting to double point values again. Dare to Double is scored Points, Then Time. The winner is the dog finishing with the most points. In case of a tie, time is the tiebreaker. The table is live during the entire run. If the dog gets on the table at any time, scoring ends. Tunnel / Contact Discrimination ~ Certainly the tunnel under the contact trick can be solved with handling. But it should be a very certain training objective to teach a dog the name of these obstacles so that we can approach such a challenge in competition with a degree of confidence, and without actually having to “handle” it. The simple training method is to spend at least 20 minutes a day on repetition in which we give the dog a) the name of the obstacle, and b) praise and reward for doing the obstacle that we’ve named. Okay, that sounds simple enough. I should remind you that consistency is the means by which the dog learns. When teaching the dog to discriminate in this fashion, the dog trainer should be carefully remove any handling cues from the presentation of the obstacle except for maybe generally facing in that direction. Praise should be warm and genuine. And the reward should be something that the dog greatly desires, whether that be food, or a game with a toy. * * * Practice these skills daily. We’ll test your commitment to homework at our next session together. Much of our adventure with the National Dog Agility League was spurred along by the filming of a dog agility reality show “sizzle reel” by Bishop Lyons Entertainment. It’s really kind of a cool concept. We envision a program that features a Top Dog team with some spiffy agility dogs and handlers who compete on a course that anyone in the world can put up and try their own dogs (and compete against that team on TV). The sizzle reel is done. This week I have a Skype conference scheduled with Bishop Lyons in which we will discuss the marketing of the Top Dog program. The “sizzle reel” is nothing more than a marketing advertisement, intended to entice a network to buy and publish the program. Cross your fingers, eh? The agility world would love a program that features our favorite sport. Whether this will be an interesting and compelling (and profitable?) program for a network is an unanswered question. In the meantime we are building the league. We are at an awkward moment in which the founding Franchises are coming into being; and we are defining the scope and purpose of the agility league. We’re at the sock hop, the band is playing, but everyone is sitting in their plastic chairs around the ball-room waiting for somebody to start the dance. Within the week I will publish a three month schedule for league competition. I intend to establish the pro forma methodology for writing league rules and guidelines. And we will establish methods for recognizing agility championships in a recreational competition. Jim Basic once told me, agility is just dogs jumping, and playing in the grass. What an interesting illusion! The Alamo was released in 1960. John Wayne played Col Crocket and had that famous line “Ya don’t get lard less’n you boil a hog”. 1960 was a great year for movies. Hitchcock’s Psycho is probably the best known release. But there was also The Magnificent Seven (which had like Yul Brynner and Steve McQueen); Inherit the Wind (Spencer Tracy, of course); the original Ocean’s Eleven (the Rat Pack, with Sinatra as Danny Ocean). There was also Sparticus (Kirk Douglas) and The Time Machine (Rod Taylor) which were my favorites of the year… but I was 7 years old, after all. I’m watching the Alamo on the TV as I write this. It almost hurts to know how it ends. On the Internet I ran across an English-to-Shakespeare translator; [http://lingojam.com/EnglishtoShakespearean]. I was searching for the meaning of a Macbeth quotation. Being lazy, I took a big bit of text from something I’d written on Yahoo group, and pasted it in… you know, to see what it looked like in Shakespearean English. I ran across this thing on the int’rnet that is an English to Shakespeare translat’r; [http://lingojam. com/englishtoshakespearean]. I was searching f’r the meaning of a Macbeth quotation. Being. distemperate, i took a big bit of text from something i’d written on Yahoo group, and past’d it in… thou knoweth, to seeth what it look’d liketh in shakespearean english. Apparently I already talk pretty Shakespearean, since little was changed. That means I have a propensity to be dense and incomprehensible. The only thing I really learned from this adventure with the internet, is the meaning of the word “distemperate”. I realized that I had seen the word many times in print but my distemperate nature kept me from actually looking up its meaning. Sounds kind of like a disease a dog might have. 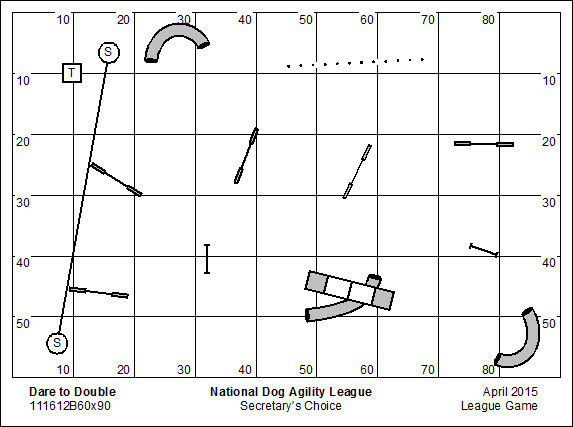 Although I am a bit late, I am posting the first of two National Dog Agility League courses for the month of April. The course I’m posting today is a novice course, intended for inexperienced dogs just learning to play (and of course open to every Masters dog who wants just plain show off). The novice course is set for a training exercise that I’ve used for many years to develop some very basic handling and distance skills. I won’t belabor the training objectives. It’s more fun to leave that part of it to your imagination. We’ve added the Box Game, a novice game for the benefit of Aki Tomita an agility instructor and enthusiast in Japan. He explained that his classes are new and his students are novice, and suggested that they won’t be ready for the more technical courses until much later this year. We’ve added the novice course for his convenience and torment. I’m including in this posting to my blog some information about the Tandem Turn which is for my students. We’re having a discussion of the Tandem because that’s what my students need to be working on. I am not trying to suggest that the Tandem is the end-all be-all solution to the Hobday box featured in the Box Game. Indeed, this set of equipment is a training exercise that I use largely to teach a squaring Front Cross; and for robust discussions about the inside-the-box Front Cross, and the layered Front Cross. I recognize that these are terms of my own invention. Note that every time either the attributes or the mechanics of a movement change, then the movement deserves a both a separate label, and a separate discussion. This is officially my 1000th blog posting. Break out the balloons and party whistles. The Box Game is the invention of USDAA judge, Brian McGunigle. Brian conceived this game for a USDAA Starter/Novice-only trial held by ARFF in Massachusetts in 1999. People said they had fun running the game. One of the club members later reported to Brian to say they had subsequently used it in class for training. 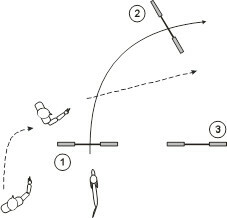 Like a typical Jumpers course, the dog is required to perform the course in the order and direction specified by the judge. The dog will earn a 10 point bonus if the handler does either of the following: Begins and remains inside of the box throughout the dog’s run, or Begins and remains outside of the box throughout the dog’s run. The Box Game is scored Time, Plus Faults, Less Bonus. The smallest score wins! 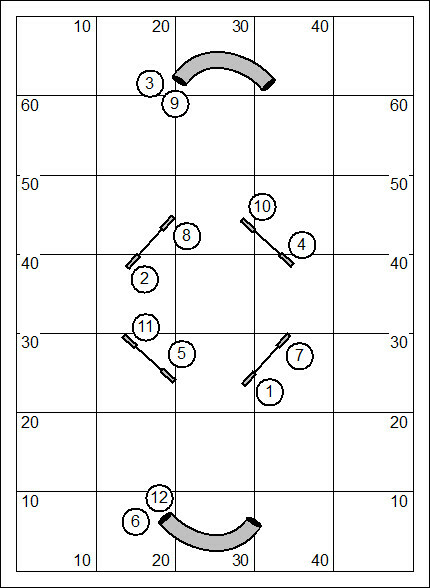 This training game can be put up in a variety of floor spaces. 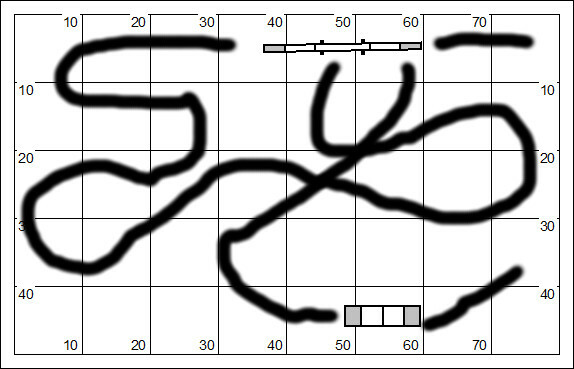 The drawing above, with the briefing, shows a 50′ by 70′ field. At my place, I’ll set it up in such a way that it would fit nicely in a 60′ by 60′ field. The weave poles in this drawing aren’t really a part of the game. But the game gets a bit more interesting when played with weave poles, to be sure. The advanced league game follows. Just so you know, this is an existing game for the catalog. There are more than 50 recorded scores. So if you do really well at the game, you can earn a heap of Lifetime Performance Points (LPP). A Tandem Turn is a cross behind the dog on the landing side of a jump, on the exit from a technical obstacle or tunnel, or on the flat. It’s important to differentiate the Tandem from the back cross, which is a cross behind the dog on the approach to an obstacle. An important distinction in the Tandem is that we disregard the rule of thumb that the handler should always be positioned on the side of the turn, because the dog turns most naturally in the direction of the handler. There are times when the clever and evil judge will design a course that intentionally positions the handler on the wrong side of the turn. The handler needs an answer to that riddle. Note that the handler’s position should be only slightly forward of the dog. The handler must be ahead enough for the dog to actually see the cues for the turn, while at the same time not so far ahead that the handler can’t step behind the dog. There is a bit of a controversy with the Tandem Turn, that is, which arm should be used to signal the turn. It’s reported that Susan Garret calls the “off-arm” the “evil-arm,” and advocates using only the inside arm. Okay, “inside” arm sounds kind of obtuse, something that might belong to a Martian. To simplify, the “inside” arm is the arm nearer to the dog. However, I discovered that one of my dogs, who I’d been struggling for over a year to teach the off-arm Tandem, understood the “inside” arm immediately. He got it the first time he saw it, and made the turn perfectly. So, I no longer call it the La La turn. This is now the Inside Arm Tandem. Another significant difference between the off-arm and inside-arm presentations is that the off-arm signal becomes the new lead hand at the moment of the signal. When using the inside-arm, the handler needs to switch to the opposite arm immediately after making the signal with the inside arm. He also has to remember to rotate his body. One thing that using the off-arm does, it forces the handler to rotate his shoulders. The inside-arm signal doesn’t do that. Oh, as to the controversy about which arm to use. I like to operate under the assumption that we’ll use the arm that our dog implicitly understands. There are no “one size fits all” solutions in agility. The Tandem Turn should always be learned with experimentation. In fact, with some dogs respond to both signals, but give a different response to each. 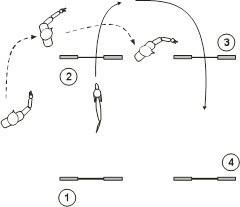 This illustration shows a scenario in which the turn is still away from the handler’s position, but the true course is the gentler path up to jump #2. I would always use the inside-arm Tandem in this situation. I have a dog (Bogie) who takes the off-arm as a “hard and deep” instruction. He’d flip back to jump #3, giving jump #2 a pass. He’d interpret the inside-arm Tandem as a gentler turn, and would be, properly, directed to jump #2. Some dogs don’t immediately “get it.” They’ll turn towards the handler, rather than in the direction of the turn. Sometimes this is due to an error in the handler’s motion. But more often, it’s a plain fact that the dog turns most naturally in the direction of the handler. For a dog like this you should take exceptional training measures. You’re in luck if the dog is toy or ball motivated. 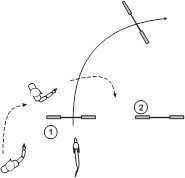 The handler can shape the turn away by throwing the toy or ball at the corner of the turn. This should be repeated, over an over, until the dog is taking the movement of the arm as a cue, even before seeing the toy go whizzing by his nose. Next the handler will approach the turn and pretend to throw the toy. But immediately after the dog makes the turn the handler should throw the toy. The handler/trainer has made a transition from “lure” to “reward,” a very important concept in dog training. Just because a dog understands the turn in one direction, that doesn’t mean he understands it in the opposite direction. Both turns should be trained repeatedly. Don’t forget to experiment with both the off-arm signal and the inside-arm signal. This is a variation of the Tandem that I call the “New Jersey Left,” or the “Whiplash Turn.” Have you ever driven a car in New Jersey? In order to turn left you actually have to turn right three times. What’s that about? Sure, it gets the job done. The handler changes lead hands and goes on without mishap. The bad part of this movement is that it chews up a minimum of about three seconds without actually going anywhere. You can see people do the New Jersey Left in competition all the time. It’s really quite funny. Sometimes the New Jersey left is done intentionally. Sometimes it’s done by accident. Refer to the same drawing, above. What the handler is doing is picking up his right arm, the lead hand change used to signal the dog into the turn. The problem is that the arm is pointing the wrong direction. Sometimes the handler will actually lean in the opposite direction of the turn, or take a little sidestep that way, and then push into the turn. Of course by this time the dog has already turned in the wrong direction. The only fix for this is to demonstrate how people turn corners. You move to the corner, and then you turn and go in the direction of the corner. What you don’t do is flap in the opposite direction, or lean first in the opposite direction. Remember, dogs already understand how we move. That includes how we turn corners. The handler, in a Tandem Turn, should turn the corner the very same way he’s been turning corners his entire life. 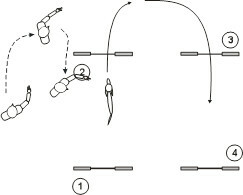 In this sequence the handler steps in front of the dog, intruding on the dog’s path, turning the dog more sharply than intended. This is not a Tandem Turn. The handler isn’t in position to do anything about it. The Tandem is a cross “behind” the dog. If there’s any question of anatomy, the “behind” is the bit with the tail, a difficult concept for those who own Aussies or Corgis. This might be saved first of all by showing a very aggressive rotation of the handler’s shoulders. In the illustration the handler is using an inside-arm Tandem. It might be better to use the off-arm so that the turn goes hard and deep. Note that there are dogs that hate the Tandem Turn. On a percentage basis they are relatively few. But if a dog hates the Tandem, the handler should be advised to find another answer. You can tell when a dog hates it. The dog will come to a complete stop or otherwise simply shut down. It’s never the handler’s objective to shut down the dog. When teaching the dog the Tandem a handler who consistently steps in front of the dog rather than behind the dog may shut the dog down. Great care should be taken to keep the handler from doing this to the dog. Continue work on the Tandem Turn. Next time we are together we will test the Tandem by demonstrating a layered movement. We also want to work on Progressive Sending. This is the simple skill of sending the dog forward to a jump, or to do two or three jumps while the handler remains behind. For everyone using “Left” and “Right” directionals; when next we meet, we will test whether your dog actually understands these absolute directional commands. 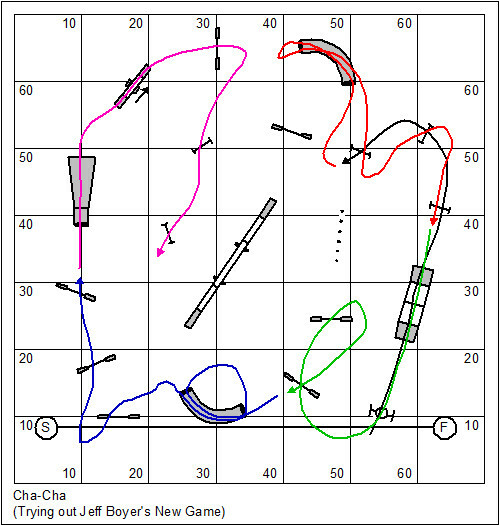 This is a dog agility course design discussion. I’ve been reviewing something like 200 courses a day, for a couple of days now… just getting caught up on my course review duties. 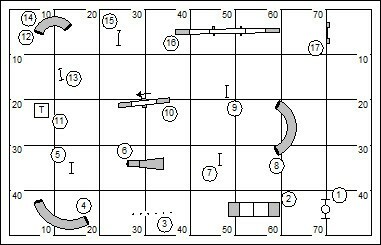 I’d like to pause to share with you the discussion of the basic “Em” design for agility courses. I’ll use a sample course to demonstrate my point. I want to pause for a moment and reflect on what I see in your course design. The basic problem is the “M”. The predominate concept in the design of too many of your courses is a down & back – down & back design premise. You’ll recognize that makes an em. The problem with an “M” on a field that is only 40′ or 50′ wide is that inescapably you must track four parallel flows locking you into very narrow channels. The real secret for designing for a space like this is making your flows serpentine… going back and forth across the ring as you make your way back. It will change everything. Truly the secret for designing in a small space is in the repetition of obstacles. 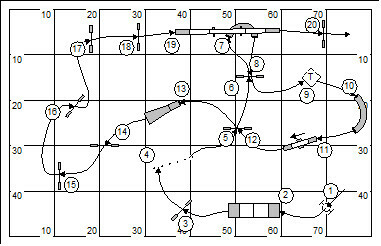 Note too that the course designer pretty much disdained the use of the front of the ring. At the risk of sounding downright unscientific about the process, what I’m going to do is throw away everything… but hold onto the placement of the A-frame and dogwalk. Then I will draw a whimsical line. The next step will be to position obstacles on that line in equally whimsical fashion. Be mindful that the required obstacles for the class need to be included. I’m pretty sure that the “Em” design will allow more dogs to be successful. The Em design simply does not / can not challenge handlers and their dogs appropriately who are competing at the Superior / Masters level. The whimsical course that I designed includes several compelling challenges: A very tough approach to the weave poles; a counter-side tunnel discrimination; a strong wrong course option; a modest backside; and a threadle to backside. Now we’re talking! I want to make it very clear that this is a matter of education and is never intended to be a defining/condemning kind of criticism; (though, to be sure, I can be blunt in my course reviews). In the last few days I’ve been working on a suite of courses for an upcoming USDAA trial that I’m judging; and I know that I’ll be going through the course review process. Don’t you know… the USDAA course reviewers are still taking me to school, and I’ve been designing courses for something like 25 years now. Lordy I have a bunch of work to do! I’m a bit behind on TDAA course review (I promise to catch up over the next couple of days). And, I’m embroiled in the start-up of the National Dog Agility League (NDAL). Right now there are results coming in from our March league… and I am the designated event secretary. So, I’m compiling results for posting. The Top Dog blog this morning was a discussion of getting our judges trained: http://wp.me/p2Pu8l-3g. I approach the mission of this training with a touch of humor and compassion. There is certainly some work to do. You know, I was thinking, I’d love to go into the world and help clubs get going with league play. We could introduce a lot of games and attend to judges training and certification (??) at the same time. I could do this on a very inexpensive basis (my wife is gonna yell when she reads this). Anyway, if you’re interested, get in touch. I’ll have the calendar on my desk. Will travel. I made a list yesterday of all the yard work, property and facility chores that I have to do. This threw me into a fitful bout of procrastination that surely was at odds with the work I need to do. I’ve watched the Lincoln movie (starring Daniel Day Lewis) several times now. I’m amazed at the intellectual content of the film. In a time when movies seem to be dedicated to low-brow short attention span tripe, it is fun to find a movie that inspires one to think. The movie Lincoln revolves around his short discussion of Euclid’s first common notion: Things that are equal to the same thing are equal to each other. The 13th Amendment would ultimately lead to all people in this country being treated with the same rules of equality and justice. This is a notion that is still tested today in issues of gender equality and the rights of the LGBT community. Lincoln was a man of extraordinary vision. You are currently browsing the Bud Houston's Blog blog archives for April, 2015.